Whitestone Wood at Bargain Wood (NRW)0300 065 3000work Forest or WoodlandWhitestone Wood lies adjacent to a section of the famous Wye Valley Walk. Visitors to the site can enjoy pleasant walks that take in a number of fantastic views across the Wye Valley. The Whitestone picnic and play area offers visitors the opportunity to relax in beautiful surroundings with barbecue facilities and a unique children’s play area. Beautiful mature Oak and Beech woodland with large Douglas Fir and other mixed broadleaves. Whitestone Wood is part of Wye Valley Forest area. Chepstow is the nearest town or village. There are three walks that go through this woodland. This trail takes in three dramatic viewpoints and returns through an attractive mix of woodlands. This trail starts by following the Wye Valley Walk waymarkers to an avenue of huge Scots Pine trees. It then reaches the Duchess Ride viewpoint where there is a bench. Retrace your steps back to the car park. The Wye Valley Walk passes through Whitestone Wood. This is a 136 mile long distance walk along the River Wye between Chepstow and Hafren Forest. You can join the route from Lower Wyndcliff car park. From the village of Tintern follow signs for Catbrook and Trellech at the junction adjacent to the Wye Valley Hotel. Follow this road for about two and a half miles to a junction and the entrance to Whitestone car park is opposite. Follow the forest road up to the car park. Whitestone Wood lies adjacent to a section of the famous Wye Valley Walk. 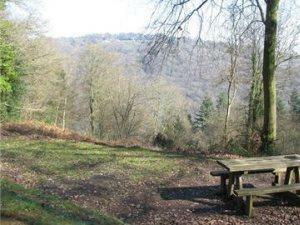 Visitors to the site can enjoy pleasant walks that take in a number of fantastic views across the Wye Valley. The Whitestone picnic and play area offers visitors the opportunity to relax in beautiful surroundings with barbecue facilities and a unique children’s play area.